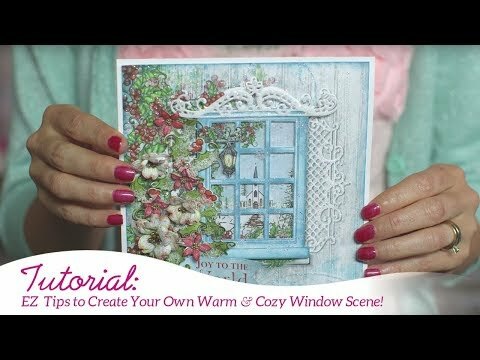 For tips on creating your own window scene see this video. Instructions: My finished card size is 4 1/2" x 6". Start with white cardstock cut to 9" x 6". Score and fold at 4 1/2". Die cut window center outline from HCD1-7148 die on the card base. Next choose your paper from the paper collection to cover the card base. The yellow is 4 1/2 x 6" and the sunflower paper is 4 1/4" x 5 3/4". 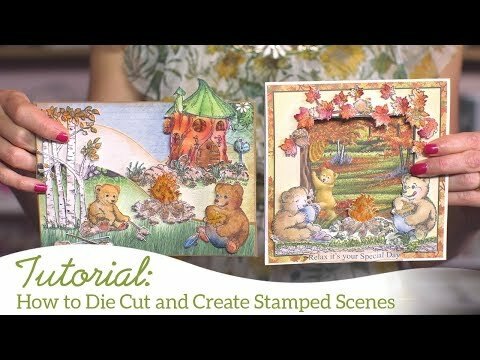 Use the daubers to ink the yellow with Cantaloupe ink and the sunflower panel with Paris Dusk ink. Adhere these two panels together. Place panels on card base to mark where you will want to die cut the window opening. Die cut these panels using the same HCD1-7148 window center outline. I also added a 4" x 5 1/2" panel on the inside to complete the scene. Stamp the window frame twice on kraft cardstock using Colorbox Dark Brown Ink. Die cut one with both the window die and the center panes die. This will be for the front. Die cut the second one using both the window frame die and the center outline die. Adhere this one directly on the inside of the card base as a finishing touch on the back side of the window opening. From the Window Box Elements die HCD1-7150, die cut intricate lattice die from cream cardstock and cut in half lengthwise. Die cut two window boxes, one flower arranger, and one window box border from designer paper. Ink the window box lightly with Toffee Crunch ink, border with Olive Grove ink, intricate lattice with Toffee Crunch ink. Stamp one of each of the Sunflower Accents HCPC-3799 (two of the oval leaf) in black Archival ink on white cardstock. Die cut with coordinating dies. Color using Memento inks. I used New Sprout, Olive Pastel, and a touch of Cantaloupe on the green oval leaves and sunflower foliage. Sunflowers and second oval leaf in Cantaloupe, Tangelo and Morocco. Oak Leaves in Rich Cocoa and Morocco. Maple Leaves in Cantaloupe, Tangelo and Rhubarb Stalk. The border I only used the acorn with a leaf. I colored it with Peanut Brittle, Rich Cocoa for the acorn and Cantaloupe, Tangelo, and Morocco for that leaf. Shape these using the Deluxe Flower Shaping Kit. Fold and assemble window boxes along with the flower arranger. I assembled and glued one window boxes and glued one side of the flower arranger to window box. this will allow you to cut and arrange flower box fillers as desired, gluing with dries clear glue and adding foam dots as needed inside the flower box. Once you have everything arranged as desired adhere the second window box to the back, creating a 3D window box. Add dries clear glue inside the flower box and sprinkle with Redlands Elements. Allow to dry. Adhere shutters directly to the back of the window frame. Adhere window onto card base using foam dots cut in smaller pieces. Adhere window box onto card front using dries clear glue. Finally, cut a sentiment from designer paper with a flag cut, inking the edges with Morocco ink. Add a few more leaves and acorn to the left of sentiment using dries clear glue and a foam dot.